A local service bus heads out of Aspen for Glenwood Springs this week. 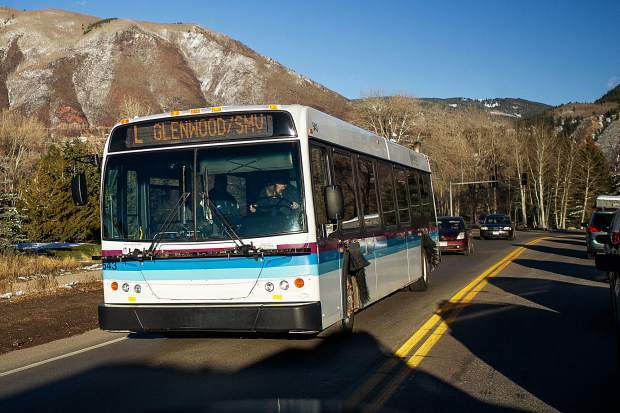 Bus service between El Jebel and Glenwood Springs will be increased after 8:15 p.m. thanks to voter approval of a property tax hike. Trail users can expect improved and new routes, bus riders will get expanded service and pedestrians can look forward to safer passage now that voters have approved a property tax for the Roaring Fork Transportation Authority. RFTA officials wasted no time getting to work on a plan on how to implement a wish list of projects after voters approved a property tax that will produce about $9.5 million annually. CEO Dan Blankenship told RFTA’s board of directors Thursday that the senior staff met Wednesday to start updating a strategic plan that will determine when the agency gets to specific projects. “We’ve got most of the things we could conceivably do over the next 20 years on our list,” he said after the meeting. Increased frequency of some bus service will start almost immediately. For example, local bus service between El Jebel and Glenwood Springs only runs once per hour after 8:15 p.m. RFTA intends to boost that to 30-minute service on weekdays during spring and fall, and daily during summer and winter peak seasons. Tweaks to operations can be made pretty easily, Blankenship said. Coordinating a phasing plan for the capital improvement projects takes more time. “We need to make sure that in any given year we’re not blowing it out of the water,” he said. A handful of projects are earmarked for funding in 2019 and 2020. They include funding next year for repavement and other improvements to the popular Rio Grande Trail next year and initial work on the Lower Valley (LoVa) Trail west of Glenwood Springs. RFTA also wants to provide seed money for the expansion of the WeCycle bike share program in Carbondale and Glenwood Springs in 2020. Safety improvements also have a priority. RFTA is contemplating relocating the Sagewood bus stop closer to the intersection of Highway 82 and Original Road. The current location is far enough downvalley from the traffic signal that some users dash across the highway. It’s been the site of fatal vehicle-pedestrian incidents. RFTA is looking into relocating the stop to the upvalley side of intersection, creating a longer but safer walk because it would encourage use of the signal. A pedestrian crossing at 27th Street and Highway 82 in Glenwood Springs is also high on the priority list. Regular replacement of old buses is also part of the plan. RFTA plans to purchase 29 electric buses to reduce noise and pollution. A strategic plan outlining RFTA’s steps for the next three years will be brought by the staff to the board for review in January. RFTA officials were in a celebratory mood at Thursday’s regularly scheduled monthly board meeting. “First of all, I really need to thank the electorate,” said George Newman, board chair and a Pitkin County commissioner. The property tax proposal was approved in Pitkin County and the eligible parts of Eagle and Garfield counties. The vote was 10,945 in favor and 10,067 against, a margin of 52 to 48 percent. The vote was nearly dead even in Basalt, El Jebel and surrounding neighborhoods. Pitkin and Garfield counties provided the winning margin. “We started off maybe a little late and a little slow,” Newman said of the campaign. Personal time spent by the staff, board members, volunteers and consultants made the difference, he continued. “It was an incredible team effort. That’s what was needed,” Newman said.